The campaign to legalize recreational marijuana in 2012 touted that a portion of the taxes generated from marijuana sales would go to schools. 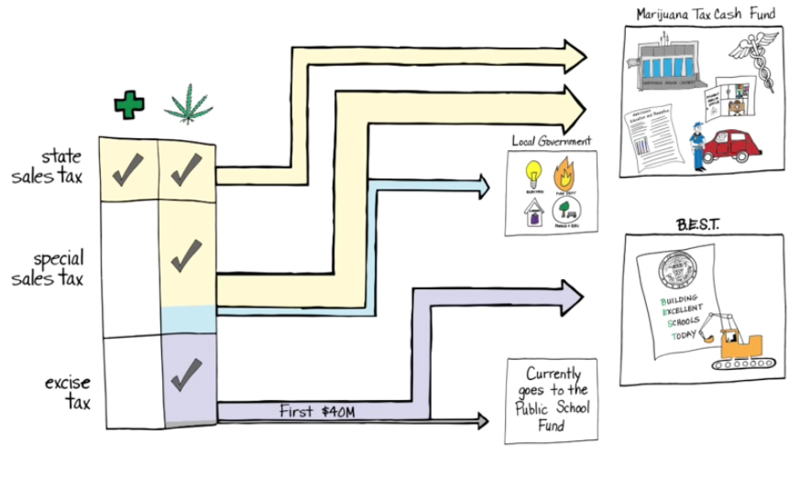 So how is all that marijuana money benefiting your local Douglas County School District school? Unfortunately, by very little, and for most DCSD schools, not at all. In fact, while there have certainly been facility improvements made to schools across Colorado as a result of taxes generated from recreational marijuana, the reality is that the tax revenue is tiny in comparison to the school funding needs in Colorado. Almost none of that revenue goes towards operational costs for our public schools, and most of the schools in the Denver Metro region do not benefit from this fund. WATCH: The Marijuana Money Myth: What about all the money from pot? So where is all the marijuana money going? There are three different ways that marijuana is taxed in Colorado. Both medical and recreational marijuana are subject to the standard 2.9 percent state sales tax that we pay on most products we buy in Colorado. Beginning in 2013, two additional voter-approved taxes have been applied to recreational marijuana. The first is a 10 percent special sales tax applied to all retail sales of recreational marijuana. As marijuana usage increases, so does the need for public services, such as health education, substance abuse and treatment programs, law enforcement, and health care. All of the state sales tax and 85 percent of the special sales tax go toward these corresponding costs of marijuana legalization by way of the marijuana tax cash fund. Schools can apply for a small portion of the money in the marijuana tax cash fund for school health professionals. For DCSD, this has helped bring on one additional prevention counselor in all nine middle schools in the 2017-2018 school year. The other 15 percent of the special sales tax is allocated to local governments based on the marijuana sales within their boundaries. As the sale of recreational marijuana is prohibited in Douglas County, our local governments do not receive a portion of this remaining 15 percent. An additional excise tax occurs when a wholesaler transfers a shipment to a retailer. This is taxed at 15 percent. The first 40 million dollars that is collected from this excise tax goes to a statewide grant fund called the BEST program and can only be used to support school construction or repairs. Once this $40 million dollars has been reached, any additional tax collected from the excise tax can be allocated elsewhere by state legislators. Are DCSD schools benefiting from BEST grants? Unfortunately, $40 million dollars is a drop in the bucket compared to the capital needs of school districts, which total billions of dollars. While any of Colorado’s 178 school districts can compete for a grant to rebuild, repair or replace the worst of Colorado’s K-12 facilities, projects are prioritized based on need, with awards typically going to the lower funded rural school districts. DCSD received only one BEST grant in 2009-2010. Additionally, some DCSD charter schools have received capital support funding from the Charter School Capital Allocation Fund, available to any of Colorado's nearly 240 charter schools. Approximately 20 percent of this fund's overall budget comes from marijuana tax revenue each year. From 9News: Where does All That Colorado Pot Tax Go?